Gameplay: The game comes in a DVD-Rom disk. After installing, an optional GameShadow program, a PC patching system for automated patching of games and drivers is seen. It is up to you, if you want it installed. The US release does not have Starforce disk protection program installed. For the European release only - The StarForce disk protection program is also installed. For Starforce to take effect, the computer has to reboot. Before the game can play, enter the Starforce disk registration number that is found in the inside front cover of the manual. The DVD disk has to be in the drive to pass through the Starforce program. You have to do this every time you quit the game. Once the game is going, the disk need not be in the drive. The title frame has choices for start of game, type of installation, hardware settings, updates and internet forum. The hardware settings have option changes for anti-aliasing and speaker systems. After the introduction, the main menu can be accessed by using the ESC key. The main menu has new, load, save game, settings, control and quit. The load frame has the graphic as well as the time-date of the saved games was done. The save game page has the blank graphic frame and the label of the saved game to be entered. Click 'save' to save the game in progress. There is a switch on the right to go 'back' to previous page. The settings page has the music, dialogue, SFX volume controls and the gamma correction. A red button below allows for subtitles option. The controls page shows the default keys: ESC is menu, M is Messenger and H is hints. The left mouse button is for interaction and the right for look. The look feature of the right mouse button makes your character look at things. Each actable item shows a label when pointed at by the cursor. The inventory bar at the bottom of the screen is accessed by moving the cursor to that black bottom part of the screen. Clicking on an item makes the item attach to the cursor. Items in inventory can be combined by placing an item over another. The inventory bar can be scrolled for hidden items by placing the cursor at either end of the bar. Dialogue options are seen when the talk cursor is clicked on an NPC (non-player character). Dialogues that have been used are darker colored (bold) than new dialogues. Pressing the left mouse button skips the dialogue. Double clicking makes Peter run. Note: This is a dialogue based adventure game. Exhaust all dialogues or some clues and triggers might be missed. Use the 'can I ask you something' dialogue repeatedly until all the dialogues have been highlighted. Peter Wright is a communications designer. His wife and child have been killed in a plane crash that caused him to lose interest in things. The introduction shows a satellite over planet Earth and the target zooms in on a street in New York City. A police SWAT team enters the 23rd floor of Peter's apartment. Through the peephole, Peter watches as the police take the man from next door. He sees the wife and the child left behind. Hall: The inventory has a Zippo lighter. Pick up the teddy bear dropped by the little boy. Right click on the bell nameplate of the neighbor's damaged door. The family's name is Oswald and the wife's name is Debbie. Enter the apartment and right click on damaged door. Click on inner door. Try several times and then go back to your apartment. Peter's apartment: Go to bedroom at lower screen. Open the side table drawer and take the Messenger. Messenger: Right click the messenger in inventory. The scroll arrows access the Info Center. Click on green phone icon to call the info center #111. I need the messenger number of a family named Oswald at NY, Tillary St, 352. Click the down arrow and Mrs. Oswald's number is highlighted. Click on green phone to call Mrs. Oswald. Talk to her and then ask to give her the boy's teddy bear. Click on red phone to close the messenger. Oswald's apartment: Go next door. Knock on door. Talk to Debbie. Graham is the husband taken away and Tommy, the young boy is in shock. The police know nothing about the incident. Peter will check with the police. Go back to your apartment. Peter's apartment: Let's check the place out. Click on left side of cupboard. Use the man closing door icon outside the cabinet to close the door. Look at drawers at bottom of cabinet to see toys. Go to room below the screen. There's a rental shelf beside the bed. Click on computer on the table. Click on chat message to talk to Christine. Click on the left 2 drawer to get your business card from the top one. Look out the window. There's a whiskey bottle on the table in front of the Telescreen. Use the messenger to call Info Center to get the NYPD number. Call the police yourself #999 using the green phone icon. Learn that there's no operation in Brooklyn West in the last week what more the last few hours. Click M on your keyboard or take the messenger out of inventory. Call Mrs. Oswald and tell her that you will check things tomorrow. You will talk to Bob at Kiosk. Oswald's apartment: Go out to the hall and to the Oswald apartment. Talk to Deborah. Learn about Graham's work. Then talk to Tommy. Learn about Virtual Palace and the alien toy. Tommy is interested in Mr. Nuke. Talk to Tommy again about dad's picture. Get Graham's picture standing in front of a structure. Go back to your apartment. Open the drawer below the cupboard and take the action figure. Go back to Oswald's apartment and Give Tommy the action figure. Get the alien doll. Exit the apartment. Check the locked Floor Toilet (WC) by elevator. Click on touch switch of elevator to go out the building and to the street. Bob's Kiosk: Go to Bob at kiosk bottom right of screen. Talk to Bob and exhaust all dialogue. Graham Oswald yelled something before he was taken by the police. There were 2 young guys - placing a sticker of Alien Attack Club on the telescreen. The police drove towards Downtown over the Brooklyn Bridge. Click the alien toy on Bob and he says they look like the posters of the 2 guys. There's Essex St. on the posters. Click out of the scene. Brooklyn Park: Go up the stairs to go to Brooklyn Park. Once at the park, hear a man preaching some alien ideas. Go to park exit at middle of park under the city highway. Talk to the screaming guru. Look at -right click the 'place to sleep'. Take the wire that holds the bar under the skull (totem) in the foreground. Look at - right click the casket by the water outlet on the left. Talk to guitar player by the tree and exhaust all dialogue. The guitar player can't hear the guru because he is deaf. The guru was possibly a former physicist who won a contest to go up to orbit. Nuclear Cafe, at lower East side is the place to get 'smoke' but you need to change your outfit first. Take the park entrance exit. Then take the Tillary St exit on the left. Talk to Bob again about the guru. Click on SatCar, yellow cabs at top left of the screen. Click on destination input at bottom of screen. Go to work at Downtown Manhattan. Great Central Plaza: Go left a bit and talk to the man up the stairs. Enter the main entrance of the GCP building by using the messenger on the terminal button. Claire, the guard robot: Click on Claire, the robot guard with a woman's face at the center of the floor. Exhaust all dialogue. Wright, Peter, 73rd floor, Greenberg and Winter. Any other way to identify myself? Chose to let Claire issue you a temporary password after an audio-visual connection. Mr. Greenberg verifies your identity. Write down the password given - pl56f9olp4r. Talk to Claire again and select the correct password. Press the elevator button and it should open after Claire verified your password. You do not need to go through this with Claire again. Just go directly to the elevator next time. Agency: Click on Brenda, the receptionist. Look around the Agency. Talk to Brian in one of the cubicles for some personal and work dialogues. Learn about the Luddites that blew out the plane that carried Laura, Peter's wife and son. He should have been with them. Talk to Brian in the kitchen on personal matters. Find out that Brian was an ex-con - ex-hacker. Talk to Bill at the upload monitor by the far wall for more agency bickering and work dialogues. Learn about the slogans the company puts out all the telescreens. Go the management floor up the stairs at the end of the room. Talk to Mr. Greenberg. Ask him about few business related questions. Learn about the upcoming vote of a proposition and the anxiety propaganda. Be sure to get a few more days of vacation until next Friday. Go down the Agency floor, out of the Agency and out of the building. Take a SatCar to Lower East Side. Theft: Hear foul taunts shouted at you. Right click the Essex street sign. Go down Essex St and click on the Obey art on the left. Look (right click) on the car wreck left of the poster filled shed. See 2 guys sitting on the bench. They are the ones shouting all those foul language. Talk to Juan. After you select the angry dialogue, Juan steals your messenger. Watch Juan run to a building at upper Essex St. He knocks on the door and comes out with a game console. Talk to Big Mike that is left in the 'park'. Follow Juan and knock on the door of a colorful building where Nuclear Cafe is situated. Nobody's home. Rita: Talk to the streetwalker standing in front of the telescreen left side of the street. Learn that the knock code for the door to be opened is 3 short and 2 long. Go back to the door of the Nuclear Cafe and knock. The door opens after the code is knocked. Nuclear Cafe: Talk to Lou, the man until you get your messenger. Take the messenger in front of a computer on the table behind you. The table is the one at the center of the room. Look around the place. Then talk to Lou about everything. Learn about the cryptographic method and alien conspiracy. Luddites center was here. The Luddites, who are against all technology escaped through underground tunnels. Cypher, the genius master programmer is his partner. Cypher: Show Lou the picture of Graham Oswald. The background is a parabolic dish. Cypher finally allows you to the backroom. Go to the right side of the cafe. Take the hall left of the stage and forward to the backroom. The backroom is Cypher's office. Talk to Cypher. Learn about the commandos that took Graham. Talk to him over and over until all the dialogues are highlighted - bold. Bill's code is sexmachine_bill_2044. Be sure that you talk to Cypher about analyzing Graham's photo. Cypher's payment is to upload a slogan on the telescreen at Essex St for one hour showing. The AAC CD is in inventory. Look around the office and look close at the work bench with the solder at right top corner of the room. Go to top of screen above Cypher and left to leave the office. Exit the building and take the SatCar back to the Agency in Manhattan. Agency: Go to the right side of the Agency. Talk to Bill, still standing in front of the upload monitor at right wall. Talk to Bill again about something to eat. He wants Litelife microwave meal. Exit the building and take the SatCar to Brooklyn. Bob's Kiosk: Talk to Bob. Buy the Litelife meal from Bob. Go back to the Agency. Agency: Go to the kitchen which is the first door on the left side of the Agency. Microwave - Try placing the meal in the microwave and find out that there's no power. Go to the right side of the reception desk and open the fuse box above the magazine rack. Flip the 'off' switch to 'on'. Go back to the kitchen. Place the plug right of door into the socket and place the meal in the microwave. Click the arrows to show 2 minutes and then press start. Look around the Agency while waiting for the meal to get warmed up. Tell Bill his food is ready. Now that Bill is gone, look close at the Upload Terminal. Insert the AAC CD on disk slot at bottom left of the terminal. A4325. Exit the building and go to Lower East Side. Nuclear Cafe: Check the telescreen for the uploaded slogan of Alien Attack. Knock on the door of Nuclear Cafe. Go to the backroom and talk to Cypher about 'I did it'. Talk to him again about the picture. The parabolic dish is in SETI in Aracebo in Puerto Rico. Call Deborah Oswald using the messenger. Talk to her completely about 'your husband'. She will also mention Terminal B at JFK as the flights departure place for Puerto Rico. Agency: Talk to Brian and find out Mr. Greenberg is in Beijing. Go upstairs to the management floor. Look close at Mr. Greenberg's desk. Click on the 'piece of rubber pad sticking out at right of the desk. Take the key and use it on the keyhole of the drawer. Take the flight check-book. Leave the building and take the SatCar to JFK Airport. JFK Airport: Enter through the departure door. Click to look close at the clock and see the present (your computer's) time and the game's date. Go up the stairs and look around. From the left side going right: the Information Center, terminal A for Space Elevator as shown by picture on sign, Air Lounge, terminal B for planes, Locker and terminal C for Zeppelins. Go forward to terminal B. Click the flight check-book on check-in of terminal B. Research Center and Dr. Price - Enter the Research Center. Talk to Dr. Price, the man standing by the stairs. Learn about SETI operation and how the scientist does not know what the weekly checks done by the technicians of the Communication Services do to their system. They are up on the second floor now doing their hardware checks. Talk to Dr. Price again about visitor here. Learn about 'Drake' forgetting his bag and it is with Paul at the Gift Shop. Radio telescope - Go around the raised walkway above the showcases. Then click at bottom right below the man looking out the window. Exit the building through the open door. Look at the parabolic dish, hanging radio telescope and the mysterious steel door. Children's Observatory - Go to and look around the observatory left of the research building. Look around and look close at one of the virtual telescope. You can enter a galaxy number and have your picture taken. Let's see, click to get 3342.4768, press enter, look through the ocular and see the galaxy just entered. If you want a picture of the galaxy, press 'print'. Bag at Gift Shop - Exit the building and go to the gift shop. Click on shop door and the bag is thrown out. Right click the bag in inventory and the contents are taken out - knife, old videocam and a thread. Right click the thread and 'Where did I see this thread before?' is said. Click right of gift shop (pass the clothes rack) and forward to get to the front of the research building. Take the SatCar and arrive at JFK. Brooklyn: Talk to Bob at the kiosk. Oswald Apartment: Talk to Deborah completely. Learn about Graham's box at the airport. Show the thread to Deborah. Talk to Tommy about his Teddy. Use the knife on the teddy in inventory. A videotape is taken. Talk to Deborah about the tape. Take the SatCar to the Agency. Agency: Go to the empty cubicle at the set closest to the stairs. Take the magnet holding the XperiMental paper. Talk to Bill still standing at the upload screen about the magnetic tape. Bill mentions about Huntington at Greenwich Village. Greenwich Village: Check the building just across from you at right side of MacDougal Road. Antique shop door - Click on door of the Antique Shop. It is locked. Look close on door window and see that a metal sign fell off. In inventory, click the thread with the wire and then click the 'fishing rod' with the magnet taken from your desk. Use the 'fishing rod' with magnet on the mail box on the door. Right click the caught sign in inventory - this places the number of the Antique Store in your messenger. Call the Antique shop using your messenger (right click) and talk to Mr. Huntington. Inside the shop, look around. Climb the ladder to take a close look at the pigeons. Look close at the books in the corner shelves by Mr. Huntington. Take the radio play - The War of the World tape from the book shelves. Go to the cash register and talk to Mr. Huntington. Learn about the pigeon and the Unions. His wife disappeared during the Luddites riots. The NYPD was looking for Geoffrey Stein, the computer programmer. A man named Emerson has supposedly taken his role. Keep on talking to him until you get 'looking for certain device' dialogue. Go to the right side of the shop while you are facing Mr. Huntington in a far view screen. There is a table by the wall that has an electronic device. Click on the VCR - electronic device and you take it on a promise to pay cash later. Nuclear Cafe at Lower Eastside: Talk to Lou about Rita. Talk to Cypher in the backroom. Ask about the cable on the work bench. Give Cypher the radio play Orson Wells tape. Pick up the cable at workbench with solder at top right of room. Go back to Brooklyn. Now how do we use the VCR? Peter's Apartment: Place the VCR on living room table. Connect cable to VCR on telescreen. Place VCR tape on the VCR. Watch the telescreen. See the airport clock at 1:46, a dirigible-blimp-zeppelin and coordinates like the ones at the Children's Observatory - 8227.9347 and 2234.6621. To watch the tape again, click on the VCR. Use the computer and see a chat message. Talk to Christine. Oswald's Apartment: Talk to Deborah and look for the safe deposit key. Take the key on the table on your left. JFK airport: Go to terminal B and click the flight check on the check-in terminal B.
Observatory at SETI: Take the path right of the research center (left of the tower) to the children's observatory. Use a virtual telescope. Press 8227.9347, click 'enter'. Look through the ocular and see a satellite. Print and take this picture. Press 2234.6621 and click 'enter'. Look through the ocular and see another satellite. Print and take this picture. If you make a mistake in the numbers - you see stars in the ocular and the picture is not placed in inventory. JFK airport: Turn right before terminal B and click on lockers. At the close up view, click on 'view' right of the lockers to see the zeppelins. Right click the locker key in inventory. Which locker? Go to the left side of the terminal, pass the Air Lounge. Left of terminal A is the Information Center. Enter the Info Center and talk to Ms. Evans at the desk. Learn about the Space elevator and lottery winners. Go to the glass entrance doors but do not exit. Click on window right of exit door. Make a comment about homeless people. Mrs. Evans leaves the desk. Go behind the desk and look close at the surveillance system. See at bottom right monitor - Cam 6 watch on 9-20-2044 at 2:23:00, Graham Oswald walked to the lockers. The locker code seen is 2543. Diary: Go to Lockers and insert silver key on 2367 keyhole. Press 2543. Take the diary. Right click on diary in inventory. Read the diary. Delbridge in Greenwich Village is the Luddite contact. Learn about Mary, Graham's chat friend; the plane crash of Emerson and the missing Delbridge. Emerson's plane crash is the same incident as that of Peter's family. Reread the diary for clues for upcoming puzzles. Who can explain the satellite pictures? Cypher at Lower Eastside: Show Cypher a satellite photo. They are communication satellites. All the data are filtered through these satellites. Who can tell us about the eavesdropping possibilities? Mr. Huntington at Greenwich Village: Notice the baldheaded man in black trench coat that stopped right by you, it's the same man that appeared when you first visited here. Use the messenger to get Mr. Huntington to open the door of his Antique shop. Talk to Mr. Huntington about all your discoveries and he will open the backroom. Follow him to the backroom. Talk to him completely. Learn about Echelon II and the Luddites. Look around the room. Enter the aisle behind the magazine pile by the door. Turn on the light switch. Read (right click) about all the magazine articles - news tacked on the wall. Note the 'interesting' photo at the bottom of the wall that shows a zeppelin on an offshore platform. Talk to Mr. Huntington again and learn about the platform - Bermuda Research Station. He wants you take carrier pigeon. Read the magazine cutting on the wall beside you. Go to the shop and take a carrier pigeon from the cage. Climb the ladder and click on a pigeon. The rod will pull out and a pigeon is taken. Brooklyn: Go to Peter's apartment and go to bed. See a cutscene of a machine scanning Peter. Just like Graham's experience in the diary. Look out the window. Use the computer and see another chat message from Christine. Hmmm... Remember Mary of Graham's diary. Oswald's Apartment: Talk to Debbie about the diary. Actually, I think I do. Debbie promises to be quiet about the findings. Peter's Apartment: Talk to Christine again. Temper was lost! Click on computer again. Apologize. Doorbell rings. Listen to a black suited man say that you won the Lunar 5 lottery for a luxury week in orbit. Talk to Christine via computer about the lunar lottery. Christine bought the ticket for you. Talk to Bob at the kiosk. Lunar 5 Entrance: Talk to Hostess Linda. Your habits are known. You are given a cocktail. Room 28: Look around and press switches 1, 2 and 3 from the Lunar 5 entertainment wall. Check the window to see earth. Exit room 28 and go down (way down of screen) the long corridor. Go left and then right to the entrance area. Right click on the engine door at right side of the pool door. It is locked. Linda: Go left, down across the pool and back to entrance area. Talk to Hostess Linda again by the elevator. Learn about the experiment at Sector B, CubiChem and the cocktails. Dr. Jenkins is the person to talk to in order to adjust the er... dosage of the cocktail. Learn about Linda and how she got here. Also learn about Guru and the ventilator unit in your cabin. Recreational Area: Go to the recreational area at top of screen passing the spacesuit. Talk to Mrs. Winter, the elderly lady holding a dog on the left side of the pool. That cocktail is something. She is your boss' wife. Ask Hostess Linda about the woman with the dog. Lollites? Go back to the pool and talk to Dr. Jenkins by the pool completely. The cocktail is meds for schizophrenia. Whew! Sir! Go down to the foreground pass Mrs. Winter and further down the pool to the other end. Talk to Mr. Stiller standing by the window beside the bar at the end of this area. He is a telecommunications engineer. He is brainwashed. He got a gift from a friend too. Go to the left end of the bar and take a cocktail. Right click the cocktail in inventory and see that there's something at the bottom of the cocktail. Walk down the bar and see Dr. Jenkins's favorite place at the bar. Talk to Hostess Linda again and ask about the guy in the jogging suit. Room 28: Go back to your cabin pass the other pool, up the hallway and then up again to room 28. Click on the hand scanner. Take the toothbrush glass and the towel from the sink area. Look close at table. Place the glass on the table. Place the towel over the glass. Pour the cocktail over the towel. Take the capsules. You have someone in mind. Place the towel on the air shaft above the door. That took care of the aerosol drugs. Press button 3 and learn that the normal setting is 21% Oxygen, 1% Carbon dioxide and 78% Nitrogen. Recreational Area: Go back to the bar at other end of pool area. If you see Dr. Jenkins on his favorite place at the other end of the bar, go back to the space suit or elevator area and then come back until you see him standing on guard at the other end of the pool. If Dr. Jenkins is now standing guard, go to his empty favorite place at the bar at the other end of the pool. Look close at his plate and cup. In inventory, use the knife on the capsules. Place the opened capsules in the cup. Go back to the spacesuit or elevator area and then go back to see if Dr. Jenkins is having his coffee break. Watch. See him feel not good and leave. Look close on his favorite spot and take the radio transmitter. Go to the locked door right of the pool door close to the cabin area. Use the radio transmitter on the cover right of the locked door. Press the red button-touch switch that appears when the cover slides out. Pressure chamber: See a locked door at one end. It's dark in there. See a switch panel turned off on the left of the bulkhead door. At the other end is the locked door to Sector B where those 'experiments' are carried out. Open the Sector B door - Look close at the blue display panel. Enter the normal setting as stated in your room: Bottom left - 21 for oxygen, top left - 78 for Nitrogen and top right - 1 for CO2. Press the now green square central button. There you go - that's the elevator. 117 Sector B: What is this a plant? Machines make machines. Go down the plant and see a discarded object at the top of the assembly line on the right. Take the tool and energy stick at the center of the discarded object. Right click to learn about this flying objects with red lights (Omni-maneuverables). Sabotage a spybot: Go to the bottom left assembly line and see the objects launched in different pads. Stand by Launch A22 and take the energy stick from the discarded object in inventory and click it on object ready to take off. A new energy stick will be in inventory. Exit to the elevator at other end and then out through the red door to reception area. A hostess meets you and says there has been an incident; the station must be evacuated immediately. Back at airport, talk to Lou standing at corner before the left stairs. A UFO crashed in Nevada. Guess which UFO crashed and who caused it - your sabotaged 'object'. Air Lounge: Enter the Air Lounge and talk to Gerald, Cargo tech. Listen to Gerald's story. His ID card was stolen due to knockout drugs at Lower Eastside. 'Interesting'. Aha - Zeppelins! Today must be Tuesday and as noted in Gerald's diary, the day the government Zeppelins leave from JFK. Agency: Talk to Brian. He's mad. In the kitchen, he let's you have it. He got in trouble because of the upload you did. He's really mad. Try to talk to him again. Lower Eastside: Talk to Rita in front of the Nuclear Cafe until you get her business card and learn about Gerald. Talk about and get the Cargo security ID. JFK Airport: Go to terminal C at right side of the waiting area. Use the security ID on check-in terminal C. But you mention leaving your stuff in a safe place. Go to the open locker and automatically leave some inventory items in the locker. You are left with Gerald's security ID, Oswald's diary, the locker key and the pigeon. Combine the locker key with the pigeon and go outside by the SatCar. Automatically, let the pigeon fly away. Go back and use the security ID on check-in terminal C. Watch the zeppelin fly to the offshore platform. Bermuda platform: Follow the walkway and see 2 elevators and chains. Go further to the right and see more chains, fuel tank and generator. Yellow elevator: Go back to the elevators and take the open yellow elevator. Elevator Codes - Read the September 12, 2044 entry in Gerald's diary. At the bottom it says the code is TR, M, BR, B - BL, B, BR. TR, M, BR, B = Top right, center, bottom right, bottom. BL, B, BR = Bottom left, bottom, bottom right. Look close at the control unit: Press the touch switch. Left panel: Click the top arrow on the left 5xs to make TR, M, BR, B = Top right, center, bottom right, bottom. Right panel: Click the bottom arrow of the right panel 10xs to make BL, B, BR = Bottom left, bottom, bottom right. Press the yellow switch. Enter the yellow elevator and press the inside yellow touch switch. Rise up and see a door with a similar control unit. The known code doesn't work here. There's a panel left of the door that is high voltage. The locked door uses electricity. Go back down. Corner elevator: Go to the corner enclosed elevator. Do the same coding: Look close at control unit. Press the red touch switch. Press the left panel's top arrow 5xs and the right panel's bottom arrow 10xs. Press the yellow switch. Enter the elevator and press the inside yellow touch switch. You go down the elevator. Exit the elevator, go down the stairs on the left and see a rubber boat. Diving gear: Climb back up and look close at the control unit of the elevator. Enter the same coding: Press the touch switch Press the left panel's top arrow 5xs and the right panel's bottom arrow 10xs. Press the yellow switch. Press the outside yellow switch that is right of the elevator. The elevator goes up empty and a door opens behind where the elevator was. Look at the opening on the left - depot for equipment. Take the diving gear. Dive under the platform: Go back down the stairs to the rubber boat. Enter the rubber boat. Click the diving gear on Peter. Click on top right pillar. Look close at the sign - high voltage - main power supply. Move cursor to top left of the rubber boat to get diving arrow to dive down. Dive to the switch box. Click on flap. Lower the handle. Pull back and swim to the surface. Click on top left pillar. Take the floating mine. Automatically, be on the platform and lay the mine down. Verify that this is a Relay transmitter: Go back to the yellow open elevator. Again, look close at control unit. Press the green touch switch. Press the left panel: top arrow on the left 5xs and the right panel: bottom arrow 10xs. Press the yellow switch. Enter the elevator and press the inside yellow touch switch. You go up the elevator. Now that the power is off, the door can be opened. Enter the computer room. Look close at the signal display of the left panel to learn that this station is a powerful transmitter. The next panel shows that it is focused on North America. The middle panel shows coordinates display: N minus 50023 degrees. SEL 2, M 1 3. Right click on the cable drum at the foreground. Hmmm... The place was built during the 20th century. With the view looking at the exit door or the left panel, take the rope below the fire extinguisher left of door. Destroy the North America transmitter: Exit the computer room and go down the elevator. Time to leave. Attach the rope to the mine and then the rope to the cable of the Zeppelin. Inside the Zeppelin, go down the back end of the blimp. Look up, click on the flap and climb up. Watch the arrival of the Zeppelin in NY, the search for Peter, the run at the airport and the telescreen broadcast. Brooklyn is swarming with SWAT team also. Now, you are at Greenwich Village. Go to the shop. Watch the men take Mr. Huntington. He shouts... The light, the light... Peter is also caught. Watch the arrival at Governor's Island. Cell: Watch the arrival and Admission part 1. Peter, prisoner 1478 undergoes a dental process - Z-12. There are 2 guards, one is the nervous sort. Exit the cell during your allotted time outside. Go to the right side and talk to the other prisoner Brett. Go to the left. Talk to Officer Smith, the nervous, soft spoken guard completely. Officer Burton is the strict one. Officer Smith was in Lunar 5. Exercise yard: Go back to the right side and out to the exercise yard. See a magpie by the door. Note the tree in one area. Right click the watch tower beside it and Peter will note that it is run by bots. They must detect you with the dental treatment. Go back to the cell wing and into your cell. Cell: Take the bread on the table. Note: If you seat on the plank bed, it will be the next time to have the cell door open. Sit and wait for the cell check by Officer Smith. Exit and go to Brett's cell. Look close at table and take the ketchup. Thread - Go back to your cell and seat on the plank bed. Wait for Officer Smith's check of the cell. While he is checking under the bed, place ketchup on his hat. When he leaves and the door slams, he touches his forehead thinking it is blood, Officer Smith faints. Click to get a key. Use the key on the trellised gate on the left end of the corridor. Enter and take Mr. Longneck hanging above the monitors. Exit, close the trellised door and click the key back on Officer Smith. Mr. Longneck and thread is now in inventory. Tooth - Enter Peter's cell and sit on the plank bed again. As soon as able to move cursor, click the thread on the middle door bar of the cell door. Watch at a novel way of pulling tooth. The tooth with string is now in inventory. Bird - Exit to the exercise yard. Go back to your cell. Do not sit down. The doors are opened again. Go back out to the exercise yard and it should be nighttime. Entice the magpie with the bread and click the tooth on magpie. Click the magpie with tooth at the night sky. Run to the tree at the corner of the exercise yard and 'it's now or never' time. Click on the tree. Brooklyn: Talk to Bob at the kiosk. Get a MagTrain ticket. Click the MagTrain ticket on the MagTrain station above the SatCam cars. Greenwich Village: Enter the antique shop. Remember Mr. Huntington said lights, so click on the crystal chandelier to get the locker key. Exit the shop and automatically be at the airport. JFK Airport: Enter and use the key on the locker. Take all you inventory back. Automatically see that there's a voicemail from Mr. Huntington but no sound. Brooklyn Park: Use the SatCar to go to Brooklyn. Then walk to the park where the guitar player is. Show the messenger to the guitar player. Watch! Sewer, part 1: Go up to the passage, go across the bridge, left at the corner and then forward to the very end, passing 2 side aisles. Go down 2 flights of stairs and exit through the metal door to Fulton St.
Fulton St: Flip the switch right of the Emergency door you came out of. You can see your way now. Go forward until a broken showcase. Take the subway map from the broken showcase. Sewer, part 2: Go back through the emergency door and return to the bridge at the start of this sewer jaunt. Climb the steps, left to the passage and down to the very end. Cross the bridge and go left to the new passage. Enter the passage through the opening and see a shoe on the floor. Take shoe. Go down the screen, down the steps to the very end and exit through the door. Lafayette station is the familiar. There are people here. Lafayette St.: Go forward to the people heard. Charlie is not in the mood for a chat. Enter the coach and talk with the Professor completely. Find out about Graham, the Professor and Emerson. Go to 'passage in coach' and talk to Graham. He wants to see Debbie and Tommy. Talk about the center of the system and that one of the coordinates is in the computer. Doublethink is the password. There is a private plane at the airport. Watch a cutscene of Debbie being told that they are in house confinement. Back at the coach, talk to the Professor about the connecting tunnels in the subway. Talk to Charlie outside the coach. Talk to the professor again. Then talk to Charlie again. It turns out that Rodriguez, the guitar player was a friend of Charlie. Talk to Charlie again about Rodriguez. Go back to the Professor and ask about Juri now. Learn about the lost shoe. Go to the far end of the tunnel and talk to Juri. In inventory, combine the thread with the shoe. Give the repaired shoe to Juri. Since you have the subway map, Juri will automatically take you to your apartment ventilation duct. Ventilation ducts: Peter gets to the basement of his apartment. Take the plank leaning on the wall. Peter automatically places it across the bars. Climb up and enter the ventilation duct on the ceiling. Peter climbs up to the 23rd floor WC. Click on the door and watch Peter give instructions to Tommy. Watch Tommy and Debbie. Debbie: As Debbie, click on the computer and automatically get the map with the coordinates. Go to the Children's room. Take the Jungle Bears pack from the box under the window. See that some are expanded in water. Exit the room and go to bathroom. Place the Jungle Bears in the toilet. Wait a bit. Flush the toilet when the gums are swollen enough. Talk to Number 1 completely until he gives permission to take Tommy to the communal bathroom. Click on door. Watch the escape and the meeting with Graham. Watch Peter get to the airport and then Alaska. Alaska: Look at the ice hole. Follow the string of the fishing pole to the snow path at the foreground. Look at the window on the side of the house and see the fishing pole ends here. Enter the Polar Station - Ice Lake Inn. Talk to the Eskimo behind the counter. Learn about the white man's temple up north - Domain of Darkness. There's a bell that tells when a fish is attracted to the bait. The Eskimo made a comment about the lumber tangling the fishing lines. Walk around the shop. See the string from the window is attached to a golden bell. Get the Eskimo out of the Inn to get the jet ski keys - Go outside and see the jet sleigh left of the stairs. Go behind the inn. Go forward to the plank pile behind the inn and second pine tree. Click on plank pile and see you throw one to the water. The plank tangles the fishing line and alerts the Eskimo. The Man untangles his fishing line. Go back inside the inn. 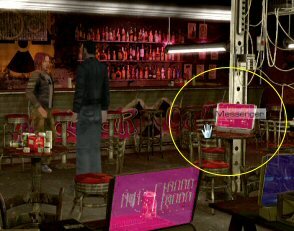 Click on the metal cabinet- keybox on the shelf on the wall behind the counter. Take a key from the keybox. Exit the inn. Click key on jet sleigh. Peter drives to the Domain of Darkness. Enter the building: Look close at the snowmobile. Flip the latch of the cover and take gas canister and rag. Go left around the Pentanet building to Entrance A. Place the canister on the snow in front of the entrance. Use rug on gas canister. Use lighter on rug-gas canister. Go to entrance and look close at the camera. The door opens. Go forward to the bulkhead. See the dead body of Johnson at the side of the corridor. Take the disk from his hands. Right click his name tag and take the note from his pocket. The note seems to be blank. Bulkhead: Go forward to the bulkhead. It is the main monitor room. Go down to the central area. Click on the computer monitor. Meet the cause of all your and the world's woes. Talk to the Computer - AI about trial. Learn all about the how, the why and the when of all these events. Listen to hear the events seen from 2 different point of views. Click on left bottom to get out of the close view with the AI. Look close at the control panel right of the stairs. The lower right shows no signal input because of the destroyed Bermuda Triangle relay station. If I want to shut it down, I need SILENCE. Go back to the dead Johnson. See that he is lying under the Evacuation Area door. Parabolic dishes: Go to the door across the hall and see a world map. Take the blank note taken from Johnson's pocket. In inventory, use the lighter on the note. The top part of the note has the letters: NA EU AF AU SA. They are abbreviations of continents. Press the continents in sequence: North America, Europe-Asia, Africa, Australia and South America. Enter and see a parabolic dish. This is one of the 5 shown on the drawing at last page of Graham's diary. To silence the transmission, the receivers-dishes should not get any signal input. Based on Graham's diary, only 3 stations are needed to be turn off to sabotage the whole system. Based on the Bermuda Relay Station, #2 is the one that is receiving signal input from North America. Since you have destroyed that relay station, also verified by the 'no signal input' on the stand by the stairs in the bulkhead - no adjustment is needed. The other 4 parabolic dishes will not receive any transmission if they are all adjusted to receive input from North America via the destroyed Bermuda Triangle relay station. So, the object of the puzzle is to adjust all the dishes to point at North America. 1. To know which dish receives transmission from which continent: Familiarize yourself by going down the stairs and make a whole rotation back to Dish 1. Note that each dish room has a stand that is used to rotate the dish. In between, the stairs is a map that shows the continent that a dish is receiving data from. Since we know that #2 dish is for North America, then we know which map shows where that dish is pointing to. To verify that #2 dish is for NA, take note of the setting - 108 on the #2 stand. Move the dish using the arrows to either right or left extreme. Go to the North America map and see that the highlighted area has moved. Go back to the stand and enter 108 again on the stand. Now, we know #2 is for reception of North America transmissions. Based on the layout, a dish points to a continent shown by the map across it. 2. Turn the dishes to point to North America: Go to the stand on each dish room and click on the arrows to turn the dish. Turn the dish to extreme right or left - 'as far as it goes'. 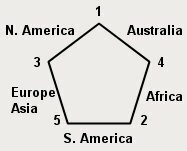 Look at the map that shows its target and see if it points to North America or to a continent that is adjusted to point to N. America in its relay. 3 dishes are needed to be silenced. Dish 1, 2 and 3 are now pointed at North America. Bulkhead: Watch the monitors in the bulkhead go down and then silence. The stand shows the adjustments for dish 1 and 2 as no signal input. A fly did a world shattering act - it landed on the #3 pad of the control stand thereby checked the system. The system crash alert blared. Evacuation is a necessity. Evacuation area: Go out to the corridor, run to the evacuation door by Johnson and run down the steps. Go over the bridge to the left and down the long bridge to the evacuation pods. Only one evacuation pod is live - #3. Click on #3 stand. See missiles are released. To change the target of the missiles: Inside the evacuation pod, look close at Rocket Control panel on the right. Insert the CD taken from Johnson's hand on the slot. To get the evacuation pod out of here: Pull out of close up view, pull the red lever and press the red button. If you are late in reprogramming the target of the missiles - watch the destruction of New York. You are given another chance. If you are in time to reprogram the missiles - watch the missiles change direction and back to Alaska, to the main transmission center - Domain of Darkness. The Pentanet Building, thus the AI is destroyed. Debbie and Peter depart to go to the funeral. Hi, my name is Susan. I'd like to get to know you.